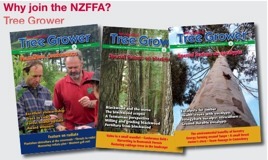 Hamish Levack, New Zealand Tree Grower November 2011. New Zealand’s current roundwood harvest is about 21 million cubic metres a year. Based on owners harvesting their pine trees at 28 years, the rotation of maximum theoretical profitability, this cut is forecast to increase only a little until about 2022. Then it will leap to nearly 55 million cubic metres a year by 2024, followed by a fall back to about 28 million by 2030. This spike is a result of the enthusiasm of thousands of private investors who, encouraged by the 1993 surge in world wood prices, decided to take part in the planting boom of the 1990s. Industry will not be able to cope with a near-trebling of the annual cut over a two year period because of infrastructural bottlenecks and shortages in machinery and skills. However, even if only a proportion of this spike in harvesting occurs, it will depress profits for some time. A flooded market will reduce revenue and a shortage of logging gangs and congestion will increase costs. Other disadvantages will be a loss of opportunity to attract investment in local timber processing and a blow-out in government’s greenhouse gas budget. It will not be the first time that New Zealand has had to cope with a bulge of maturing trees like this. During the Depression the national new planting rate surged from a few thousand hectares a year to 37,000 by 1930 and then rapidly fell back to the old level, staying there for 25 years. However the implied surge in harvesting from about 1 million to 18 million cubic metres a year in the late 1950s did not happen. This was because the spike was converted to a sustainable yield, letting the age at which the trees were harvested climb to 55 years and greatly increasing the new planting rate. The ownership structure at the time made this easy to do. Half of the depression-planted forests were owned by the government and managed by the Forest Service, and almost all the rest was owned by a few large companies that merged to become NZ Forest Products Limited. It is possible to transform the looming spike in wood yield currently forecast for the 2020s into a sustainable yield. However almost all the wood is owned by an estimated 15,000 small scale private owners, so it is going to be extremely difficult to control wood yields and increase new planting rates. To achieve sustainability, and at the same time substantial economies of scale, the estimated 15,000 forests need to be aggregated into much larger management units. This might be achieved by some owners buying others out, or by some proprietors retaining ownership and forming forestry cooperatives. However any such consolidation is impeded by the effects of the Income Tax Act. This requires a seller to declare the sale of standing timber income when it occurs, but only allows the buyer to deduct the ‘cost of timber’ when that timber is actually harvested. Usually the time value of holding money and the loss of money value due to inflation associated with it, creates irreconcilable value differences between potential buyers and sellers. This kills any interest in aggregating forest ownership or exchanging cutting rights for shares in a forest cooperative. The forestry industry needs to work with the government to circumvent this tax problem. In addition, each of the estimated 15,000 owners will have to be identified and worked with. An agency will be needed to explain good forest practice to the owners and the opportunities available to establish mutually beneficial business relationships. It will also be necessary to ensure that the national new planting rate increases from its current inadequate level of about 5,000 hectares a year to around 25,000 hectares a year. All these issues were considered in much more depth at the seminar on forestry reorganisation held in Parliament at the end of September. Several forest owners from France demonstrated how they worked together with the thousands of other small scale forest owners to maximise individual profit from an 800,000 hectare cooperative forest and reduce risks. 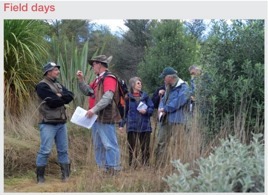 They provided a vision of where the New Zealand small scale private forest sector could be in a 20 years time. The following article summarises the proceedings of this seminar and provides edited versions of the main presentations. This is just a start. It is time to start worrying about how we are going to manage that wall of wood.